Make sure to read all the way to the bottom for special tax day savings and info on Laser Bullets, multi-caliber packs of Dry Fire Cord, and the 28 Day Good-To-Great System! forever changed their approach to shooting. If you’re interested in getting faster, first-hits directly on-target then I believe what you’re about to read will forever alter what and how you train just as it has for everyone who has seen it... regardless of how long you’ve been shooting. Back in 2013, a group of Tier I instructors from the Australian SAS had just finished teaching their new training curriculum up and down the East Coast to many of our top units. 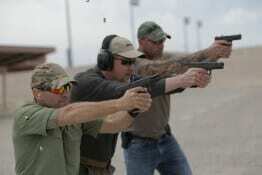 They were considered among the top combat shooting instructors in the world. Their training was cutting-edge and they were in very high demand with special mission and other direct action units. On the way back home, they decided to film a law enforcement training video in Vegas and I was graciously asked to fly down to shoot with them. After one of the modules, I asked them if they’d be interested in a tweak that would get them more effective first hits on target without sacrificing any time or changing their technique. They were already lightning fast, but I could see an opportunity that they didn’t even know existed to improve their performance. They didn’t think I could help them, but were polite, humored me, and let me show them. So, I told them the concept, demonstrated it with live fire, ran them through it with dry fire, and... within 20 minutes they were making faster first hits on-target and getting 2-3 TIMES more effective hits than they were before - in the same amount of time! Ox's shooting systems better prepare military and LE personnel to 'go outside the wire' and then come home in one piece, both physically and mentally. Imagine the sense of calmness and feelings of security and power against any attacker you’d possess if you had these same skills. And that’s not all. This was only 20 minutes... just the tip of the iceberg. Before I go further, let me briefly introduce myself...and show you a bit more in this short, 47 second video. If you don't know me, my name is Mike Ox (I go by "Ox") and I'm the guy behind Dry Fire Training Cards, 21 Day Alpha Shooter, and several other high leverage firearms training programs. I should NOT be able to shoot as fast as you’re about to see me shoot! I can’t move like a “young man” anymore… I have a long list of injuries that makes firearms training tougher than it is for many people… and these days I have nearly zero time to practice. So you’re probably wondering how I’m able to shoot this fast - and still make solid hits - from 21 ft. away like I do in this video? So you’ve heard how a world-class Spec Ops team integrated only a tiny portion of my new cutting edge training system in just minutes, dramatically impacting their time to first hits on-target as well as the effectiveness of those hits. And you’ve just seen me make sub-second hits from the holster under varying scenarios even though everything you and I know says that I shouldn’t be able to do this. Now imagine if you’re able to shoot like that...maybe even better...with a fraction of the effort as it would take with traditional training techniques. It may seem impossible for a shooter with limited time and a budget, but as you continue reading you’ll understand why it’s not. Gunfights happen faster than you think. You're WAY slower than you think you are. If you ever need to use your firearm to stop a violent attack, you're almost always going to start behind the curve. It means you aren't able to see the attack coming and avoid it. By the time you figure out something's wrong, your attacker has already observed you, decided that they are willing to use violence to get what they want, and they've started to act out their plan. That's when you're quickly going to go from having a normal day to being startled, panicked, and way more adrenalized than you are when you practice at the range. And when thinking you're "good enough" could be the last thought you ever have. Your Nice Tight "Shot Group"
Your Gun Drawn In Time! The ability to make precise shots at close range is incredibly important with a defensive pistol - often the difference between life and death. But if you can't get your gun into the fight AND INSTANTLY ON TARGET, the tightest group in the world won't save you. 95% Of All Gun-Instructors And "Online Gurus"
Are Showing You Old, Outdated "Draw Strokes"
That Can Get You KILLED In A REAL Gunfight! ...At their core, they're built on a horribly inefficient foundation and have a lot of wasted movement. It means your shooting performance is almost guaranteed to tank when you add speed or stress. They may work for the instructor, but only because they've got thousands, even tens of thousands, of hours of practice with the technique they're using. But neither you nor I have that kind of time to build a foundation we can "bet our lives on." If you want to effectively react, draw, and make accurate hits faster, it's actually much easier than people make it seem. The key is practicing less...but making the practice you do much, much smarter. I've Developed A Simple 6-Step "System"
People Will Miss It If They Blink. It's called the Draw Stroke Mastery system and it's an advanced firearms training system based on cutting edge performance neurology. But listen: During my life, I've struggled with migraines, brain fog, phantom pain, visual issues and much more. That's why I became a passionate student of brain science and performance neurology for the last 20+ years. In the process of finding neurological solutions for the problems I’ve had, I found more efficient ways to train and practice. In many cases, I was a pioneer in bringing these techniques to the firearms training world. One of those unique programs is the Draw Stroke Mastery system. It's the first program that not only optimizes your draw stroke, but how you practice it in a way that guarantees that you'll slash the time it takes to go from the holster to hits on target. Whether you're point-shooting early in the draw process or sighted-shooting at full extension - you'll make consistent sub-second, threat-stopping hits on man-sized targets at 10, 15, even 21 feet like you saw earlier. No one else dares make a guarantee like this because they don't have my proprietary 6-step process to back it up. ...A process that more than just optimizes technique, it revolutionizes the way shooters train. The Draw Stroke Mastery system uses the highest leverage techniques and training methods from my private coaching program to give you the biggest, quickest gains in speed and accuracy with your first, second, and subsequent shots from the holster. This is fantastic. I've worked with several of the top trainers in the country, but just couldn't get faster without my accuracy dropping off. I feel like a kid in a candy store...this is exactly what I needed. Part of this is because the training is NOT dogmatic. In other words, you can use it on its own or use it to refine and enhance whatever training you've done in the past or are doing currently. It's unlike any other training that is available...online or off. And until now unavailable other than to my private coaching clients. The training is delivered in video and written format and you’ll get immediate access when you sign up. Here's just a sample of some of what we'll cover and why the system is so different and is able to deliver the superior results that it has for my private coaching clients. 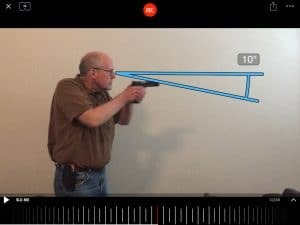 You'll learn and refine the most important point of your draw stroke…and find out why getting this right, gives you a SINGLE technique that will work in extreme close quarters situations, shooting on the move from concealment, or flat footed shots at 21 feet or further. Why the commonly used “gorilla” and “ebola” support hand techniques will slow down your first shot times and may even be dangerous. 2 "underground" tricks to get your sights on target sooner in your presentation and stay on target until you take your first shot. How to seamlessly integrate sighted and unsighted shooting. Neither one is the total answer, but when you combine them correctly, it's better than the best of both worlds. How to modify your presentation to take advantage of your eye’s “foveal cone” so you can make sighted hits on target quicker than most people can point shoot. A technique to get your brain to automatically start refining your aim from the instant your muzzle leaves the holster until you take your first shot…even if you get a bad grip or get caught up in your cover on the draw. On that note…you’ll learn why you shouldn’t stop and start over when you screw up your draw or clearing cover during dry practice. This one lesson could be a lifesaver. The impact of holster style, cant, position, retention, and cover on draw stroke speed. Two reasons why rocking the gun right out of the holster or drawing up to your armpit will sabotage your performance. You'll learn a more effective option for extreme close quarters shooting. Drills that use a free shot timer app, a 99 cent laser pointer, and masking tape or string to quickly eliminate one of the biggest causes of misses on man-shaped targets. The “against the wall” draw stroke drill and how it can help right handers who are missing to the left and left handers who are missing to the right during fast draw strokes. An unknown lighting hack that can immediately change your reaction speed by 2-10%. How to pick the right training speeds for learning quickest, testing your limits, pushing your performance envelope, and how to figure out the right speed to use for live fire. Module 6: Release The Kraken! How to unlock your maximum reaction speed. I take my training very seriously. I’ve attended over 60 courses to date at numerous traditional live fire schools. This training by far represents the best cost benefit ratio of any of my previous trainings. Going “upstream” to find the solutions to issues is a unique approach which you can expect to see more of in the future with respect to not just firearms training, but many other applications. This is a cutting edge approach, very well done! As you can see, this is a completely different approach of going from holster to threat stopping hit as quickly as possible. It's an approach so effective, it's guaranteed. By now you're likely beginning to imagine how much better your technique would be even if you just apply one or two of the things I shared. Added together, the results are dramatic. Shocking, in fact. "When I left the Unit, I suddenly found myself without time or money to train like I wanted and my skills were slipping. I originally got your training for my wife, but when I saw it, I started using it and am now shooting better with a pistol now than ever before. I didn't really believe it would work, but you made a believer out of me." You’ll develop clean, efficient technique that is naturally faster without any extra effort. And yes...it carries over to live fire. Unlike most firearms training, Draw Stroke Mastery takes very little time to do and your jumps in performance will come quickly. The lessons and drills are set up so that they literally most of the work for you. Of A Single Private Lesson. Look, if faced with a lethal threat this instant, your fate will will be determined by your reaction in the next 3-5 seconds...or less. What you must ask yourself right now is whether you can count on flawlessly executing your entire draw stroke process, knowing the threat you'll be staring at has likely already started their attack. The performance that this training delivers was simply not possible in this short of time for this small of a cost. Draw Stroke Mastery allows you to quickly bridge the gap between where you are today and where you know you must be to guarantee you'll walk away -- alive -- from an absolute worst-case scenario. By bringing bringing 20+ years of brain science into the equation, this program gives you the threat stopping skills required today with surprisingly minimal effort on your part by using the most efficient techniques and training methods. It worked stunningly well for the Australian SAS instructors, and they were already great. It's worked for each and every one of my private coaching clients. And now, it can do the same for you. Regardless of your current skill level. Option #1. The first option is to sign up for a Private Video Coaching session with me. This is what serious shooters who have trained with the best do when they want to bust through plateaus. 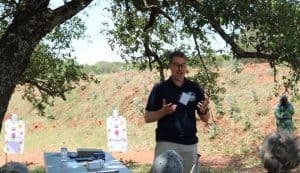 My Private Video Coaching program is widely considered the best value in professional firearms training today...even by shooters who have attended 10, 20, or even 50+ live training classes. You'll receive the Draw Stroke Mastery training, advanced tactical vision training, a custom video analysis of your technique, and a roadmap of the highest leverage aspects of your technique to work on. But I understand that that may not be in your budget this month...or maybe you'd rather dip your toes in instead of going full speed ahead. And that’s why we have another “fast mover” option for you that you’re going to want to jump on immediately. It’s for decisive people who can see how important and valuable this training is and who can take quick, decisive action when they see an opportunity like this. Option #2 is that you can get the complete high definition (HD) Draw Stroke Mastery training that you can watch at home on your phone, tablet, computer, or smart TV...starting in the next 10 minutes! In Valuable Fast Action Bonuses! Super Bonus: $97 Training Credit For Private Video Coaching! This is the top-level training that helps less experienced shooters short-cut the time it takes them to improve and helps already-great shooters bust through plateaus. So now, with the $97 live training credit and this...it's like you're actually getting paid to go through Draw Stroke Mastery! Bonus: The $27 book, "17 Self-Defense Pistol Training Hacks"
From nationally (and world) recognized military, law enforcement, and competitive shooting instructors like Andrew Curtiss, Ken Javes, Greg Lapin, Eric Leid, Mac MacKenzie, Shannon Smith, and James Washington. My analysis of over 100 armed self-defense events and how to make your training work for what REALLY happens in the real world in a violent assault instead of the make-believe that 99% of people currently train for. The book that played a large part in the dry fire training revolution that we have today. What you may not know is that 10 years ago, dry fire was laughed at, airsoft was just seen as a toy, and mental rehearsal was something VERY few did correctly. This book changed that and brought effective at-home firearms training from the shadows into the mainstream and was the inspiration for countless firearms training books and products. This patented device blocks the chamber on a 9mm pistol, gives you a visible indicator that your chamber is plugged, and gives you a resetting trigger on most semi-auto pistols (including Glocks) without having to re-rack the slide between reps. 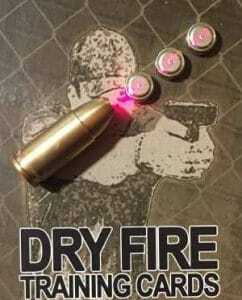 It's a must-have for anyone who's serious about at-home dry fire training with their actual carry pistol. This checklist is the golden ticket to the fastest, smoothest first hits from the holster that you’ve ever had. It would take 5-10 private lessons and a VERY knowledgeable instructor to make sure that you aren’t screwing up any of these aspects of the draw stroke, but with this one-of-a-kind punch list, all you do is work your way down the list at home with dry fire, one or two items at a time…It's simple, easy, and incredibly powerful. As an instructor, JUST working through this checklist with students will make you stand out from any other instructor in your area and could easily mean thousands of additional training dollars in the next 12 months. Value: $197. Originally developed for a top special operations training program, this is a guided 28 day 5-10 minute per day training companion for Draw Stroke Mastery that will help you make quantum leaps in performance that simply aren't possible in such a short time with any other training. It's the most advanced training of it's kind available today...regardless of the price. A half second improvement in beep-to-bang times. 1-2 second reductions in reload times. And all while delivering 2-3x tighter groups. This kind of rapid improvement and busting through previously unbreakable plateaus is not only possible, but I expect and guarantee the same results for you. A systematic approach to modulate your stress response in high stress shooting situations. < This is the key to performing at a high level in situation where most freeze or choke. Unique and previously unreleased training methods that will help you improve faster...even if you don't change your technique at all. Smarter training methods will let you make more forward progress in a few short minutes per day than shooters who spend hours at the range every week. Tools that will help you do training at home that most people think is impossible. Tactical Vision Training hacks known by less than 1% of the top firearms in the world. Joint Mobility Drills to unleash pent-up speed & power that was previously unattainable. Between the course and the bonuses, you're getting more than $1,095 of real-world value for $97 Tax day is coming up. I'm sure you could use a break and I could use a little more money to pay Uncle Sam, so if you take action right now, you save $20, the entire training is only $77, and we both win! Just click >HERE< or the big button below to get started right now. Draw Stroke Mastery comes with a 60 day 100% Money-Back Guarantee. Try the Program out and if it’s not everything I’ve written and shown you here (and far more), simply let us know within 60 days and I’ll personally see you get an immediate full refund of your purchase price. Begin using the Draw Stroke Mastery program today and you’ll see results within the first few days. I encourage you to take action right now. Get started with the Draw Stroke Mastery program, 28 Day Good-To-Great System, 9mm laser bullet, multi-caliber Dry Fire Cord pack, recoil training tool, my proprietary 44 Point Draw Stroke Checklist, and more ($1,095 total value) for only $97 $77>>That's a 93% Savings! So act now. If you have read this far it means you're serious about how you perform with a pistol in life-and-death situations. You realize that this system will get you radically better results than any other training system you've used or heard of in less time and for less money because it uses a radically improved approach built on cutting edge brain science. And, if you haven't ordered yet, it means I haven't covered one of your questions...so please, let me know what questions you've got and I'll answer them ASAP. You don't need to use your real name, but I do need you to use your email address so that I can respond back to you directly. We’ll do all of the training with dry fire with no live ammunition present for safety. You are encouraged to verify and validate your technique with a competent local instructor before doing live fire. -Won’t Dry Fire Hurt My Gun? Answer: If your gun is a quality factory made (preferably US, Israeli, or European made) handgun that was made since Reagan beat Carter and is a center-fire (not rimfire like .22), then you’re good to go. In fact, many handgun manuals explicitly say that it’s fine to dry fire. If you have any doubts, read your manual, contact the manufacturer, or ask a local gunsmith. -Will it work with appendix or behind-the-hip carry? Answer: Yes! The fundamentals remain the same. The application of those fundamentals will be slightly different, depending on your carry method, but the fundamentals will carry over to any holster situation, whether it's ankle carry, shoulder holster, or off-body carry. Answer: If you can safely and legally handle a firearm, you can do this course. There are almost 2 hours of bonus videos that will get you up to speed if you are a new shooter and have questions. If you are concerned about the course because of age or injuries, here's what I'd tell you. Everyone has a maximum performance level and it's different for everyone. The drills, techniques, and principles in the Draw Stroke Mastery system will help ANY shooter draw and shoot dramatically better, regardless of your current ability or skill level. -Does the training carry over to live fire? Answer: Absolutely. That's the whole point of the training. If you ever hear people say that their dry fire didn't carry over to live fire, it's because they did it incorrectly, and we'll show you proven ways to do it correctly. -Will this work with a laser sight or red dot sight? Answer: Yes! In fact, you'll learn how the right technique and right practice methods will give you a draw stroke that carries over almost effortlessly from iron sights to laser sights to red dots. -How long does it take? Answer: The Draw Stroke Mastery system is self-paced. The modules are each 5-15 minutes apiece. You'll go through module 1 and work on the drills for a few minutes at a time until they become natural and then move on to module 2 and so on. -Do I need to buy anything to do the training? Answer: The course uses a few training aids that you may choose to purchase, but you'll also get alternatives that are free or that you can get at your local dollar store. Firearms are designed to project force at a distance and are designed to break and destroy what they're pointed at. By visiting this site, you hereby agree not to aim a firearm at anything you aren't willing to destroy...regardless of whether or not you think it's loaded. You also agree to take responsibility for your actions and hold this site, the author, and anyone associated with the site or the author harmless for the use or misuse of the information that you find through the course of visiting this site.